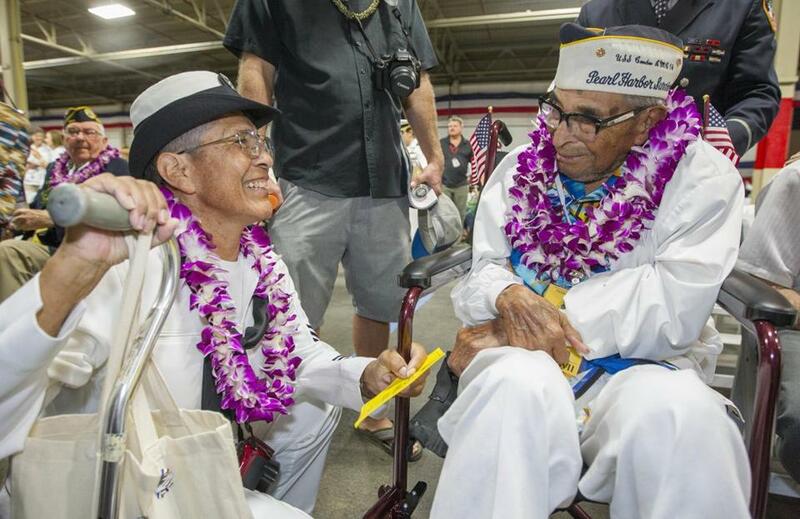 LOS ANGELES — Ray Chavez, the oldest US military survivor of the Dec. 7, 1941, attack on Pearl Harbor that plunged the United States into World War II, died Wednesday. He was 106. Mr. Chavez, who had been battling pneumonia, died in his sleep in the San Diego suburb of Poway, his daughter, Kathleen Chavez, told The Associated Press. As recently as last May, he had traveled to Washington, D.C., where he was honored on Memorial Day by President Trump. The White House tweeted a statement Wednesday saying it was saddened to hear of his passing. Daniel Martinez, chief historian for the National Park Service at Pearl Harbor, Hawaii, confirmed Wednesday that Mr. Chavez was the oldest survivor of the attack that killed 2,335 US military personnel and 68 civilians. By then Mr. Chavez, who had worked through the early morning hours, had gone to his nearby home to sleep, ordering his wife not to wake him because he had been up all night. Mr. Chavez would spend the next week there, working around the clock sifting through the destruction that had crippled the US Navy’s Pacific fleet. Later he was assigned to the transport ship USS La Salle, ferrying troops, tanks, and other equipment to war-torn islands across the Pacific, from Guadalcanal to Okinawa. Returning to San Diego, where he had grown up, he took a job as a landscaper and groundskeeper, attributing the outdoors, a healthy diet, and a strict workout program that he continued into his early 100s with restoring his health. ‘‘Then we did the 55th, the 60th, the 65th and the 70th, and from then on we went to every one,’’ his daughter recalled, adding that until Mr. Chavez’s health began to fail he had planned to attend this year’s gathering next month. Born March 12, 1912, in San Bernardino, Calif., to Mexican immigrant parents, Mr. Chavez moved to San Diego as a child, where his family ran a wholesale flower business. He joined the Navy in 1938. Mr. Chavez was preceded in death by his wife, Margaret. He leaves his daughter.